I would be lying if I said it was easy. It isn’t. It takes work just like any relationship does. The guiding force in this relationship is your mutual love for the same people- your children. No ifs ands or buts about it, the only way to look past your own feelings of anger, resentment or jealousy is to think about the children and what this means to them. Think about how they feel when they see their parents getting along and think about the example that you’re giving them about being mature adults. 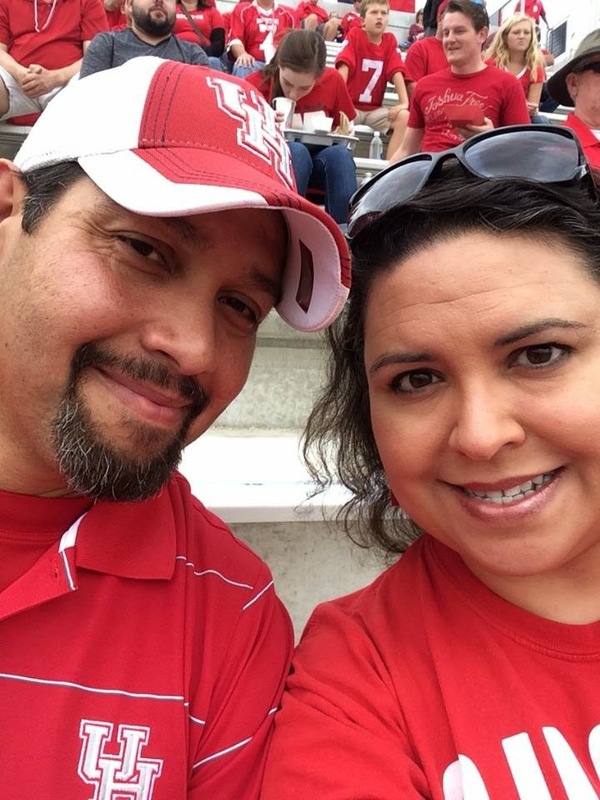 The first year after our divorce was the hardest for many reasons. He had moved on and was in a serious relationship and I started dating. We had a really rough time, including about three full months that I didn’t speak to him. Even then, we didn’t let our differences affect the children as badly as we could have. He still took them every other weekend and spent time with them. Eventually we got through that tough first year and we were able to move forward. We are now at a very different place from where we were three years ago. Example. It’s Sunday night after a weekend with the kids and my ex calls me to tell me he’s on his way home after my daughter’s lacrosse practice to pick up all their things to bring them home. He asks me what I’m making them for dinner and I tell him I have some tuna. He says he has some chicken and vegetables and offers to make dinner at his house. I say okay and go over. We eat a great dinner and then the kids pack up their things and we go home. Another day, my best friend and I are going to go out for drinks. Our boys are best friends too. My son wants to know if he can have a play date with his friend so my ex calls my best friend to tell her that he’ll keep her son while we go out. He picks him up and my best friend picks me up and we go out. He does this quite often because my best friend’s ex lives in another city. This is our village. Are we perfect? No. Do we still fight? Yes. We’re human and things happen, but we are still friends too. In the end we know that we are working together to raise two very strong and smart kids with a huge personality and sense of humor. When they were younger and I realized how loud they both were I told him, “Why can’t one of them be quiet?” He looked at me and said, “Are you seriously asking me that question?” We are both loud and so are they. I don’t want do anything to change that about them. I don’t want to do anything to affect their development as adults. I want for them to grow up strong and confident and for them to think about how we worked hard to get along for them. When I’m old and it’s my turn I want for them to remember that I took care of my dad in his old age. (ha ha) More importantly, I want for them to have a good relationship with each other and with their future partners in life. Because one day we’ll be gone and our example will be all that they have left. Last night one of my best friends asked me if I had written down my goals for 2015 yet. She said that she's writing hers down and that she remembers that I always say that we should do that. I told her I was going to do it today and that I have been thinking about my words for 2015. The first word that comes to mind that sums it all up is "Intention." It comes from a great quote/meme that I found on Pinterest a while back. This is so me! The live from habit part. I get so comfortable in my old habits, being a semi-hoarder, not cleaning thoroughly, just on the surface, procrastinating, not wanting to be bothered with some socially acceptable behaviors and the list goes on. Probably things that many of you who know me didn't know about me. Only those closest to me know what a wreck my house is or about the boxes stacked by the back door that I brought home from my dad's house a year and a half ago. I'm yet to go through them and yes, they are my mother's junk from years and years. I got that terrible habit from her and I cultivated it. 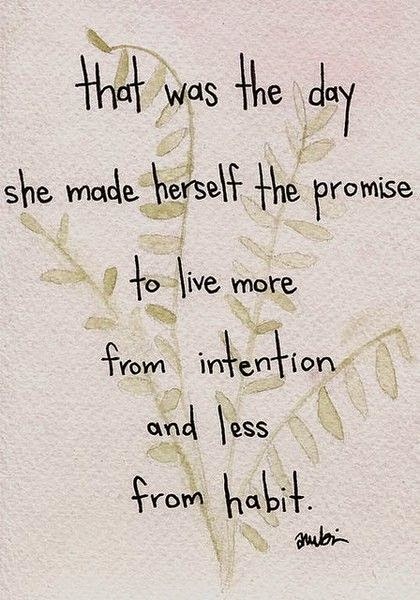 This year I promise to live from INTENTION. I have to intentionally do things in order to get them done. I can't pretend otherwise. Everything I do right takes effort. 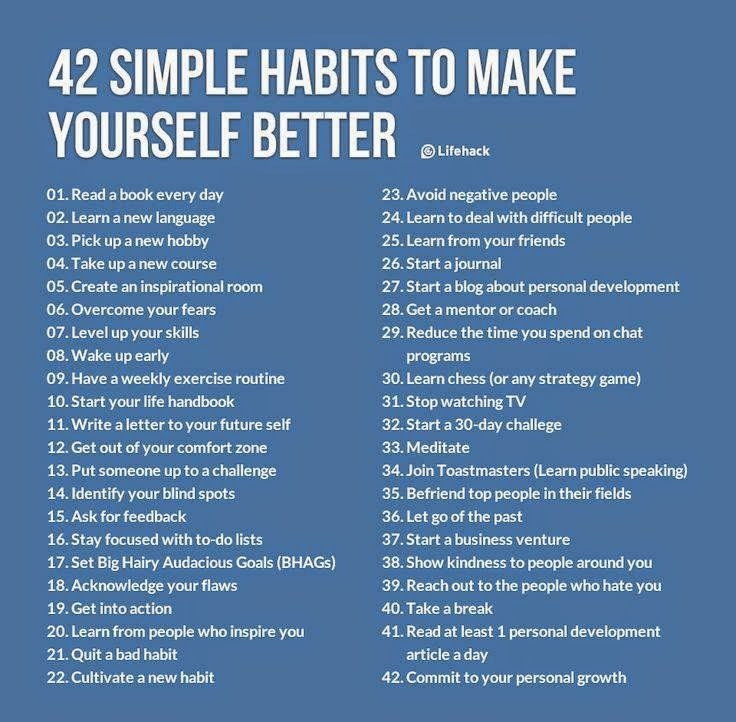 Which leads me to this wonderful list of 42 good habits to make me better. I love that this list uses the word "habits" too like the meme about living more from intention. There are bad habits and there are good habits. I know that I can't do them all so I've chosen fifteen of them that I can do. I'll choose my words for 2015 from here. Now to write down those specific goals and my words.